Undoubtedly you’ve heard about No Man’s Sky. It’s that space exploration game that’s had a vast amount of buzz ever since it was announced back in 2013. It’s a game with a beautiful art style that accentuates the universe’s 18 quintillion procedurally generated, and fully explorable, planets. But why are there so many planets? You’ll never see every planet even if you played everyday for the rest of your life. So what's the point? 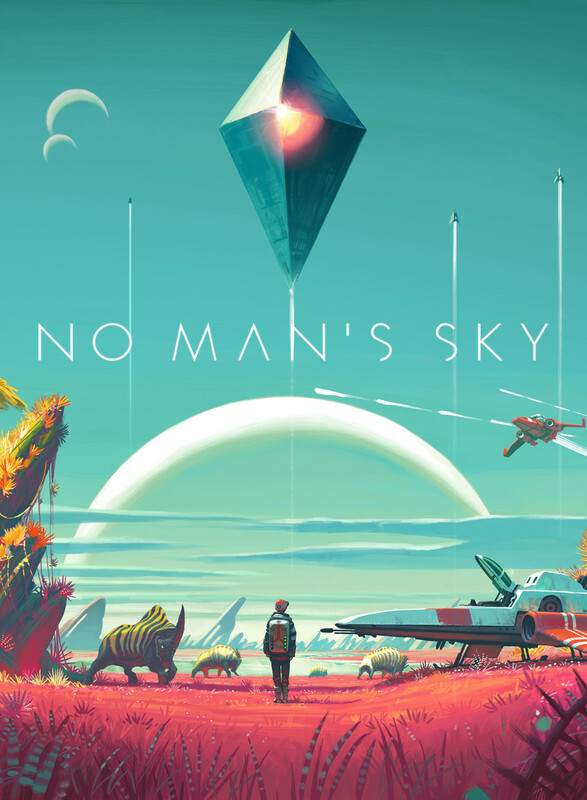 And what is No Man’s Sky actually about? We'll get to that. You begin on a random planet with a broken down ship and your only possession is a mining tool. The game proceeds to walk you through using the mining tool to acquire resources with which to repair your ship so you can begin your grand adventure. But before you leave your first planet you’ll find a wide variety of usable minerals and other such resources that can be used to craft a variety of ship and mining tool upgrades. The starter ship and mining tool have very few available upgrade/storage slots so you’ll want to explore in the hopes of finding better ones. Or better yet, mine enough valuable resources you can sell at trade terminals to make enough money to buy bigger better ships and mining tools. You’ll also find blueprints for craftable upgrades to firing modes for both your ship and your mining tool in order make quick work of killing pirate ships or mining large amounts of gold. You can also find upgrades to your exosuit that grant you more storage space. Upgrading these things to make you more powerful and to allow you to carry more items quickly becomes the main focus of the game. And while that may be enough for some people, the lack of a story will turn many away from this game. The objective of No Man’s Sky is very general. If you follow along with the game’s tips and objectives (that pop up in the lower right hand portion of the screen from time to time), you’ll soon discover that you’re supposed to navigate to the center of the universe. But getting there will take a long time, not just because of the sheer size of the universe, but because it’ll take a lot of resources to be able to travel there. Along the way you’ll meet alien lifeforms whose languages you’ll slowly learn by finding knowledge stones and alien relics scattered across the overwhelming number of explorable planets. Interacting with alien monoliths will also give you brief insights into the history of a particular alien species and their relationship to the game’s other alien species. For instance, I began on a planet with relics belonging to the Korvax, a robotic alien species who were once enslaved by the Gek, a reptilian species known for their greed and dishonesty. The Korvax view the Sentinels, sentient drones that patrol every planet like an intergalactic police force, as gods, likely for their part in freeing the Korvax from slavery (I can only suspect, as I have yet to discover the full history). Meanwhile another alien species, the Vy’keen, a humanoid warrior race, have a deep-seated hatred of the sentinels, thinking their demise would greatly benefit the freedom of exploration in the galaxy. Despite the lack of overall story and character development (you don’t know who or what you are and the game never makes a point of telling you), there is an interesting history and lore to the universe if you’re willing to seek it out. 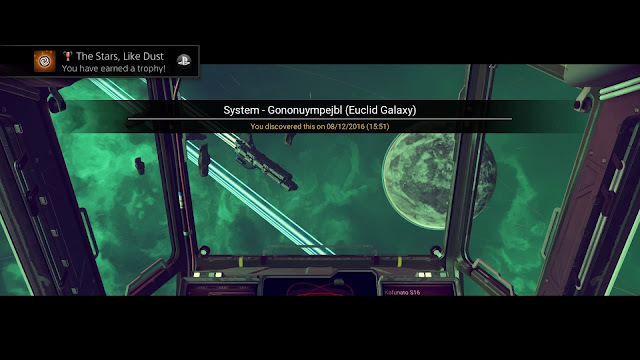 While exploring planets you’ll also find a variety of plants and wildlife that can be scanned and named. Naming the plants, animals, planets and systems is about the only “multiplayer” element to be found in No Man’s Sky. The majority of the bad player reviews on Steam stem from the developer’s failure to deliver a “true” multiplayer experience, even after claiming that there would be multiplayer “elements.” The elements the devs at Hello Games were referring to (or more likely the only elements they were able to finish in time to ship with the final retail version of the game) is the shared universe in which players can find planets named by other players, even if they can’t meet up with, or otherwise interact, with other players in the game. 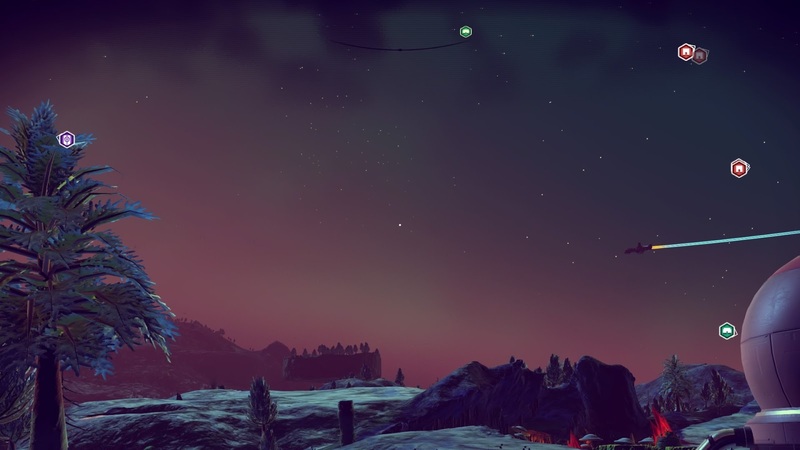 And because of this, No Man’s Sky feels like a very solitary experience. You are always alone while exploring, and there are very few aliens to meet and interact with. There are no alien villages or cities, only wide open frontiers with the occasional outpost housing one alien lifeform at a time. And the interactions available are usually very shallow engagements. If you’ve put the time in hunting down knowledge stones or alien relics, you may understand enough of the alien languages in order to have a favorable conversation that ends with you getting something of value. Or you may just walk away with nothing but lessening favor with the alien species as a whole. Suffice it to say, you’ll begin to wonder where the populated planets are and how life became so widespread across the universe that cities no longer exist. It’s a minor complaint, but contributes to making the game feel small in scope despite its far reaching ambitions. And that’s perhaps the note most gamers are getting from their travels across the universe. 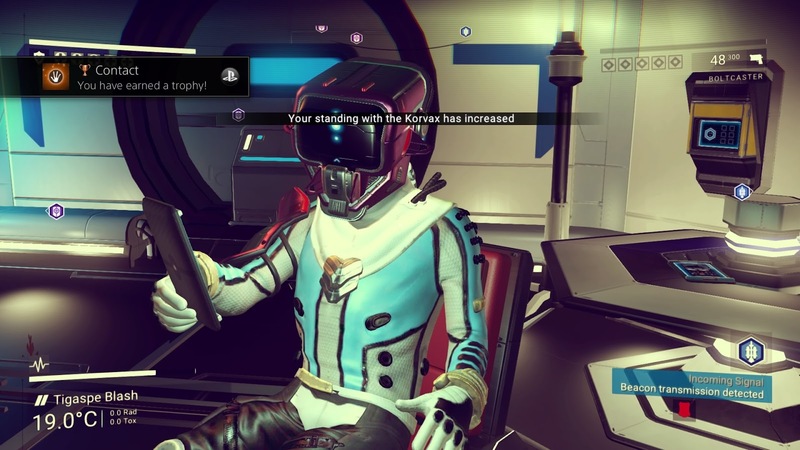 The small indie dev team at Hello Games came up with a groundbreaking concept for a game, but didn’t have the manpower or development time to create something that fully realizes their ambitions. It’s a concept in search of a story. It’s a game in need of more interesting gameplay. My first 7-10 hours in No Man’s Sky sold me on the concept simply for giving me the ability to explore a planet, then, with no loading screens whatsoever, jump into a starship and fly into space and land on an adjacent planet to continue my exploration. As a lover of science fiction and TV shows like Star Trek, I genuinely felt like an explorer traveling the universe, meeting alien races, learning about their culture, and discovering interesting looking animal creatures that I could name whatever I wanted. And the first handful of planets I landed on provided a sense of wonder as I found unique animal creatures, foliage and landscapes of varying shapes, sizes, and color schemes. This game was the open-world sandbox gamers and sci-fi fans have been dreaming of for years. But after visiting that first handful of planets the sense of wonder wears thin. The spell is broken once we realize each new procedurally generated planet offers a dice roll of assets we’ve seen before, including animal creatures that all tend to behave the exact same way. There are 18 quintillion planets, NOT 18 quintillion assets, which means after you've jumped to a handful of systems you've likely seen about all there is to see. Everything else will just be a random combination of very familiar things. And the repetitive nature of go here, mine this, craft that, sell everything else will become grating for anyone not accustomed to grindy gameplay. Worse yet, there are bugs galore. The draw distance of the graphics can be extremely poor. If you mine a large rock of some sort, run 10 meters away, and look back in that direction, the rock will reappear as if you hadn’t just mined it for every last piece of available resources. Walk back toward it and it’ll soon disappear again. It’s easy to get fooled into thinking there are resources nearby only to find that you’ve already been there and done that. And without a map or system of checking off places you've been before, it's all too easy to get turned around and wander back to landmarks you've already discovered rather than new ones you were hoping to name. However the most notable bug is the tendency to crash. This game is by far the crashiest game I’ve ever played. Thankfully the game allows for frequent saves (jump in and out of your ship for a quick mobile save) making crashes less likely to force you to replay lengthy game sessions, but this game crashes way more than any game should. But the things that result in game crashes start to become apparent after it happens a few times. It then becomes fairly easy to avoid crashes by avoiding the things that cause the crashes. For instance, the game consistently crashes if I go into the options menu and try to back out again before it loads in its entirety. So I've learned to either rarely go into my options menu (until after a save) or simply wait for the menu to load before backing out again. It's not an excuse on the game's behalf. It still shouldn't happen. But you can generally learn to avoid a number of crashes after a while. But maybe the worst thing about No Man’s Sky is that there are no stakes whatsoever. Your journey to the center of the universe can wait as long as you’re content to make it wait. Getting destroyed by pirate ships while in space combat carries no lasting penalty since you’re allowed to fly back to your death marker and reacquire all the items you dropped. And doing things the Sentinels don’t like, while exploring planets, results in an attack by the dumbest and laziest police force imaginable. If they begin shooting at you, sprinting a few meters away will make them quickly lose track of you, and they’ll give up the fight just seconds later. However if you stand your ground and they somehow manage to kill you, you’re able to return and reclaim your items the same way you would after a failed bit of space combat. And as for the various planets hazardous environments, they're all easily dealt with. Crafting the appropriate exosuit upgrade to defend against extreme heat, freezing temperatures, toxic rain, or radiation is trivially easy considering the necessary resources to do so are so readily available anywhere you go. Defending yourself against environmental hazards quickly becomes a minor annoyance rather than a compelling survival mini game. And vicious animals seem to be relatively few and far between, and they're about as easily dealt with as the Sentinels. The bugs, lack of story, and repetitive gameplay cannot go without mention, but don’t let them lead you to believe the game is without merit. The art style is beautiful, and it does genuinely make you feel like a space explorer on some sort of star trek. This is a game for those willing to make their own story. For people who enjoy a relaxing game of exploration and discovery. And for those willing to stick with it, you’ll find a game of unending playability. Keep in mind, Hello Games has promised base building and other intriguing elements to be added in future updates (presumably along with a handful of bug fixes). But what I’m really looking forward to is No Man’s Sky 2. The small dev team is, no doubt, still busy working on bug fixes and more content for the current game. And considering how long it took to make this first entry, a second is unimaginably far away at this point. But I can’t help wondering what a second game would be like, especially one that learns from the missteps here and applies the knowledge to further expanding on this great concept. Perhaps the biggest reason for disappointment here is in the misunderstanding of what No Man’s Sky is. It’s an indie game made by a small developer being sold as a big AAA release at full AAA retail prices. If you’re on the fence or turned off by the negative buzz the game has received since launch, be patient. Let the game get updated and drop in price. There’s still loads of fun to be had here. Despite the flaws, there is undeniable appeal to the niche audience it was intended for. Just keep in mind that it’s a far more mellow experience than you might have been expecting.